Open plan living is great way of bringing the family together. As our lives get ever busier, open plan living allows family members to do different activities, whilst still being able to socialise with each other. Providing informal seating and dining areas connected to the kitchen really helps to provide a space that becomes the heart of the home. Whether you are planning a new rear extension, side extension or simply reconfiguring internal walls, the following tips will help you get the design just right for you and your family. To begin with, try to picture the overall space you will end up with. Avoid over focusing on existing wall positions or the current locations of the kitchen, dining and living rooms. Although it is important to be cost conscious, try not to over compromise at this stage. For example, avoid thinking the current kitchen position is fixed, simply because of the existing drainage location. Look at other project examples https://www.dezeen.com/tag/kitchens/ and keep a folder / pinterest board of the images you like. An architect can help you visualise the space you will have by producing sketches and 3D perspectives together with floor plan layouts. Part of the skill of the architect at this early stage is to push your preconceptions of what is possible. See below example Studio Werc Architect's perspectives. The materials help to connect the internal open plan living with the garden. This is also helped by running the same large format floor tile externally. Get an Architect onboard who can produce visuals such as the one above to help you imagine the space. Ensure you maximise the natural daylight that your open living space receives. This can make the single biggest difference in creating a bright, open and welcoming heart of your home. Use large slim aluminium framed glazed patio doors. Have fewer door panels to reduce the amount of frame. The slimmer framed doors can be more expensive, but worth every penny. Include rooflights where possible, particularly for side infill extensions. Standard sized rooflights can be used to minimise costs if required. Ensure tall kitchen units are located away from natural light sources (use low level kitchen units under rooflights). Install steel beams within the floor above, rather than creating downstands, which break up the space and block natural light. Consider which elements you feel require the best natural lighting. A dining table can work well under a rooflight but a TV could receive glare if positioned too close to a South facing window. Use the pockets of natural lighting as an initial guide to locate your zones of cooking, eating and living. Utility / Laundry Room - Clutter can be shut away in these storage areas, away from the open plan living space, maintaining the 'wow factor' of the new space. A small snug / TV room also works well in these spaces, providing an 'escape' from the open plan living area. Useful, in particular for older children who need their own space away from their bedrooms. Consider the best location for views into your garden from the kitchen, dining table and sofas. What function best suits a good connection with your garden? Studio Werc Rear Extension for an Open Plan Kitchen - maximising the view of the rear garden. Provide spaces that feel informal. This allows people to feel comfortable carrying out all sorts of activities across the 'zones' of the open plan space. This in turn helps to maximise flexibility. Be consistent across your zones with your interior design. The easiest way to achieve this is to use one floor finish throughout, such as a large format tile or an engineered wood flooring. Go one step further and run the floor finish externally. Use a rug to delineate the internal seating space within the overall open plan area, whilst providing a more comfortable finish underfoot. Use feature pendant lights above the kitchen island or dining table. A low single pendant above a coffee table between two chairs can be a great way of helping to identify a seating zone. Align your kitchen units with your kitchen island, creating a clear line where kitchen stops and living begins. (A single floor finish throughout will help retain the flow between th spaces). A rooflight over a zone is another way of defining an area. A feature wall, whether it is a panelled, wallpapered or a brick feature wall. Ensure the colour, texture or material is used in small pockets elsewhere to retain that all important cohesion between the zones. See below example Studio Werc Architect's perspectives. A red brick feature wall is used to define the dining space and is also used for the external extension walls and for an external raised planter bed. The materials help to connect the internal open plan living with the garden. This is also helped by running the same large format floor tile externally. The rooflight and pendants also help to define the dining space. Again, three tones are used with pale worktops and flooring, red brickwork walls and planter bed and light oak panelled kitchen units, dining table and sliding doors. 1. 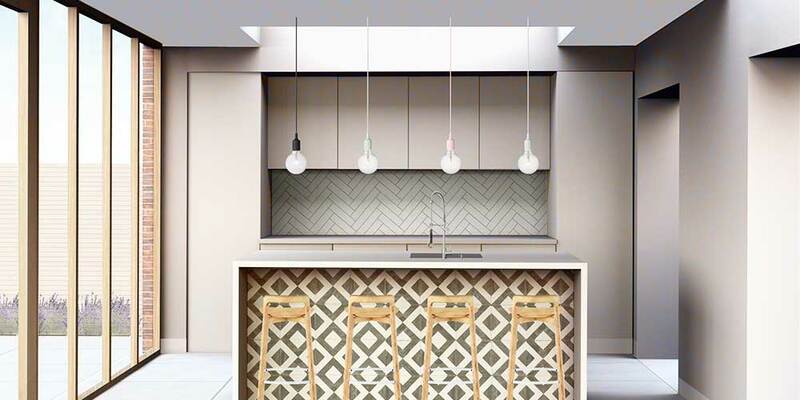 Task Lighting: Downlights and in some cases pendants, used to light raised surfaces such as kitchen work tops and dining tables - areas where you need good targeted lighting. 2. Wall Lighting: Light bounces well off walls (floors tend to be too far away from the source) which helps to create a bright room. Make sure downlights are positioned within 300mm from walls, so that light can reflect off them. Go further and use adjustable downlights, which can be tilted to focus light against walls. Whilst these tips can show you how to reach your goal of creating a great open plan living space, an architect can work with you from the start, to help you realise your aims for your home. A large roof light brings in natural light to parts of the existing space in the Studio Werc project.